As the title says, I need help blocking an area code + prefix numbers. I get a LOT of solicitation calls, usually a recording, that have the same area code and prefix of my own phone number. For example, if my number is 555-555-1212 the caller id for the number calling me will be 555-555-XXXX. Is there a way to block ALL calls to me from 555-555? I don't know anyone with the same area code and prefix as me so I doubt I would miss any important calls but I would imagine I could add an exception if I ever figure out how to blanket block the scam calls. I wonder if you could create a contact with all of the other 998 numbers in the 555-555-xxxx range and then block that contact? Or, create a series of ten contacts with 100 numbers each (with your phone number obviously excluded) and block each of those contacts? Ten, import that .vcf file to your contacts? Interesting read...next purchase will have to be a Mac so I can try that solution. You don't need a Mac to do that. Any computer with a text editor and a spreadsheet app would do it. Just copy the text in that apple discussion to create the file, and save the file with a .vcf extension. You could email it to yourself and open it on the iPhone to get a prompt to add the contact. Just use a call blocking app. I use Hiya and it automatically blocks “neighborhood scam” calls, which are those that mimic your area code and the first the first three digits of your phone number. doogald, Soreloser and Dukins like this. I think I'd go with the solution that @doogald provided. No ads, no chance of any info being saved to someone else's servers, no chance of your phone number being sold. 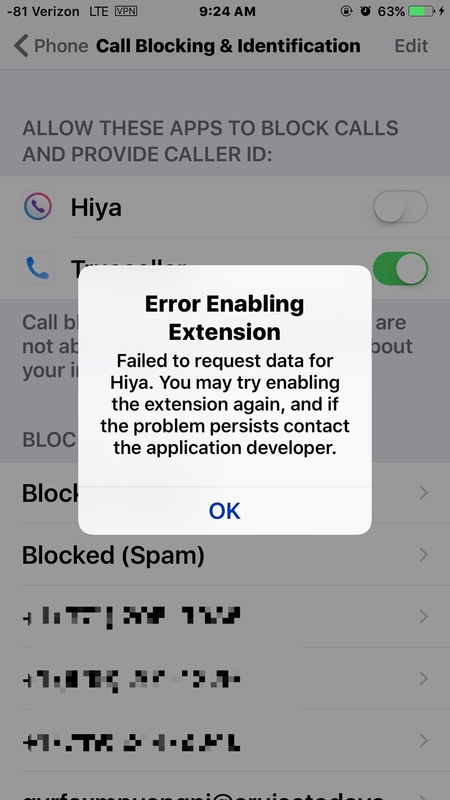 Hiya doesn’t have ads, nor does it save your info on remote servers. It uses CallKit, which is an Apple API. Hiya also keeps a very active database of scammers and telemarketers and puts a badge on incoming calls (or lets you completely block them). nor does it save your info on remote servers. We can't disprove or prove that either way, so I'd err on the side of caution and not use it at all. None of those crowd-sourced call blockers seem all that safe to me. I disagree, but that’s okay. Hiya messed me up when they updated to include the SMS feature only available on iOS 11. I don't need that, but it made other features not work. I get this when I try to toggle Hiya on in settlngs > phone. I've discussed the issue with them on Twitter, but they won't fix it. Truecaller works fine, however. I get this when I try to toggle Hiya on in settlngs > phone. I tried that. Not it. Truecaller has the same features, including the new SMS feature only on iOS 11. Theirs works ok. There was someone else on Twitter with the same issue. At the moment, I think you can only block individual numbers not just area + prefix numbers, but saying that it is still better than not being able to do either. Truecaller uploads your number to their database which I have heard gets sold. I know that my mobile that I registered with truecaller gets hundreds of spam calls and the number I never registered with truecaller has never had a spam call even though I have had that number for longer. It blocks in the way you need. Just wanted to follow up here to say that WideProtect is a legit (and only) app I found that easily blocks series of numbers. My must-do feature was the first 6 digits that were the same area code as my own but the next 3 were NOT the same as my number... which made other apps useless. Easily worth 2.99 to avoid those scum several times a day. This app is DEFINITELY worth the $2.99/mo!!!!!! The $2.99 is not per month, it's a one time purchase, and it's definitely worth it It's the only app I could find which allowed blocking all calls from my area code but from one or more exchanges which were not the same as mine. Want to switch from Android - other people that have how do you get used to it? FlipKey - iOS Keyboard with brand new gesture based typing. - Send snaps by flipping your phone! Yay posting to FB from the gallery works now.